How fast can Windows 8 run on ARM? Windows 8 will support ARM-based processors - but will it help Microsoft claw back lost ground? 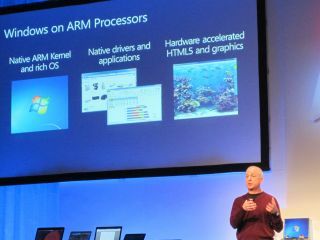 Among the many Windows 8 topics that Microsoft hasn't discussed is what ARM performance is going to be like. After all, while Windows ARM tablets will have dual core or quad core cpus running at a 1.8 or 2.5GHz speed – faster than most netbook Atom processors and the Celerons in cheap ultraportables, or even ultra-low power Core i5s - what does that mean for an operating system as complex as Windows? One of the key features will be the GPU. That's what IE10 relies on to get fast performance using hardware accelerationand IE10 is the engine powering the Windows 8 touch interface and the new breed of Web apps. ARM has been suggesting recently that its Mali GPU will be as fast as Xbox graphics within 18 months but there are other options already; both Texas Instruments and Qualcomm have announced ARM SoC packages for Windows 8 with powerful GPUs in, and Nvidia's quad core Kal-El Tegra (coming in Android tablets this year) will have 12 GPU cores in. The lead program manager on the IE team, Rob Mauceri, pointed out to TechRadar how important the hardware acceleration and multicore support in IE is for the new Web worker feature, which is what will make those Web apps run fast. But does that still hold true for browsers on mobile devices as well, like phones (or, say, ARM Windows tablets)? That's up to the OS, he told us. "It depends really on the operating system and the underlying support that's there for threading. Multi-threading has existed on single core chips and systems for years and it's really about the scheduling that the operating system does and how efficiently it does that. I think we'll see [mobile] hardware improve over time and more and more multicore CPUs on there - and at the same time it's really the OS and the interactions that you have there that enables it." While almost every PC that ships now is running the 64-bit version Windows, despite rumours ARM still hasn't publicly announced a 64-bit chip and all the ARM processors announced for Windows are 32-bit. That's not a problem for performance because while there are cases where 64-bit processing can be faster (because you can work with more of a media file at a time), in general 32-bit processing will actually be faster. And when you move to 64-bit, you have 64-bit pointers – they're twice as big so you have more data to move." That wouldn't slow down Chakra significantly; "it would be about the same speed on 32 and 64-bit but there's a definite overhead." As with Office on the ARM version of Windows, IE 10 on ARM is more than just an app Microsoft has to have running well (and it's about more than the user interface and Web apps that IE will power, important as they are). IE and Office are proof points; if Microsoft can port the full versions of Office and IE to ARM, then ARM on Windows is the same powerful operating system it is on Intel processors. Microsoft is doing all the right things to make Windows, IE and Web apps perform well on ARM. Developers of other applications are going to have to think about the same multi-threaded, GPU-accelerated way of programming to make sure that Windows apps can run fast on ARM as well.